It started with 21-year-old Udit Bansal’s aversion to joining his family’s printing business in Delhi. “I did not like the idea of running the business sitting in a shop,” says Bansal, a final-year bachelor of business administration student. So, about two years ago, he started exploring online models for meeting the printing needs of small and medium enterprises (SMEs). After a chance meeting in 2011 with Sanjeev Kakar, director, Aegis Centre for Entrepreneurship, a Gurgaon-based incubator of start-up companies, Bansal came up with a business plan. It was to set up a one-stop portal for customers to choose design and printing solutions, order from the comfort of their offices or homes and have these delivered within two to four working days. Printland was conceptualised. Through the next two months, Kakar, involved with several technology start-ups, conducted a series of dipstick surveys among small business owners, which showed positive results. Typically, small businesses need visiting cards, product or service brochures, marketing pamphlets, advertising and promotional material, branded corporate gifts, etc. Annual printing budgets of small businesses and professionals usually range between Rs 5,000 and Rs 3 lakh. “This market segment is not serviced too well by the existing set of printers, which generally focus on big-ticket orders,” says Kakar. Also, SMEs in smaller towns and cities don’t have access to cost-effective, high-quality digital printing facilities. According to industry estimates, the commercial printing market in India is worth about Rs 60,000 crore and is dominated by neighbourhood mom-and-pop firms. Unlike big-ticket customers, SMEs usually don’t get any price advantage due to their small order value and volumes. “A one-stop online store targeting SMEs made business sense,” says Kakar. In a developed e-commerce market such as the US, there are several online printing companies targeting small businesses and home offices. The biggest such company, VistaPrint, accounts for revenue of about $1 billion. In September 2012, VistaPrint forayed into India, acquiring PrintBell, an Indian online print start-up. Bipin Narang, director (marketing), VistaPrint India, says in the coming years, Indian SMEs are likely to take the online route to address their printing needs. The web-to-print technology allows customers to choose and customise their design, order online and track their delivery. The online printing space targeting SMEs has been gaining ground in the last three to four years. Mumbai-based PrintStop, launched in 2007, has been following a hybrid model with five retail print stores across the city, as has Bangalore-based Printo. PrintVenue is another aggressive online. Through his incubator Aegis, Kakar pumped Rs 90 lakh of seed capital into Printland. Bansal was a co-founder. Kakar also roped in Sandeep Behl, who had held senior management positions at Bharti Airtel and Hewlett-Packard, as mentor and co-founder. The company’s management decided to outsource the printing to a host of printers, including the one run by Bansal’s family. About 40-odd engineers and information technology specialists were roped in to handle the technical aspects of the portal. As of December 2012, Printland’s headcount stood at 55. 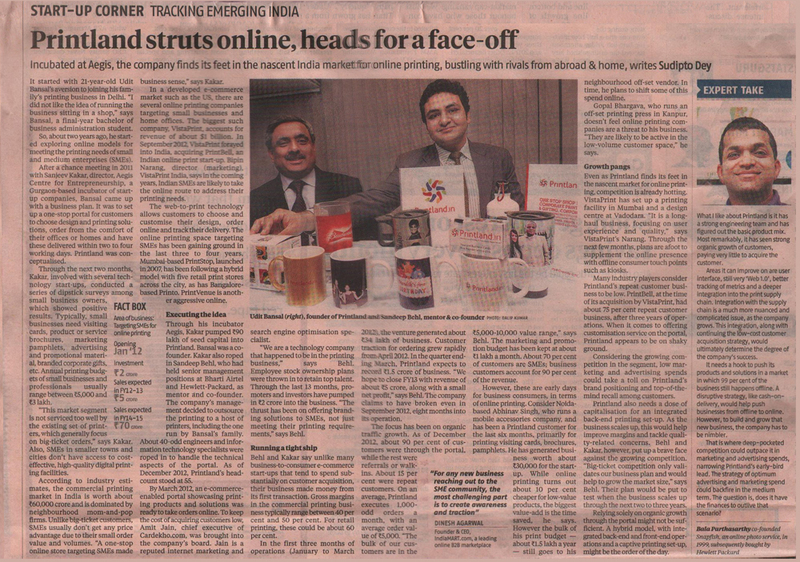 By March 2012, an e-commerce-enabled portal showcasing printing products and solutions was ready to take orders online. To keep the cost of acquiring customers low, Amit Jain, chief executive of Cardekho.com, was brought into the company’s board. Jain is a reputed internet marketing and search engine optimisation specialist. “We are a technology company that happened to be in the printing business,” says Behl. Employee stock ownership plans were thrown in to retain top talent. Through the last 13 months, promoters and investors have pumped in Rs 2 crore into the business. “The thrust has been on offering branding solutions to SMEs, not just meeting their printing requirements,” says Behl. Behl and Kakar say unlike many business-to-consumer e-commerce start-ups that tend to spend substantially on customer acquisition, their business made money from its first transaction. Gross margins in the commercial printing business typically range between 40 per cent and 50 per cent. For retail printing, these could be about 60 per cent. In the first three months of operations (January to March 2012), the venture generated about Rs 34 lakh of business. Customer traction for ordering grew rapidly from April 2012. In the quarter ending March, Printland expects to record Rs 1.5 crore of business. “We hope to close FY13 with revenue of about Rs 5 crore, along with a small net profit,” says Behl. The company claims to have broken even in September 2012, eight months into its operation. The focus has been on organic traffic growth. As of December 2012, about 90 per cent of customers were through the portal, while the rest were referrals or walk-ins. About 15 per cent were repeat customers. On an average, Printland executes 1,000-odd orders a month, with an average order value of Rs 5,000. “The bulk of our customers are in the Rs 5,000-10,000 value range,” says Behl. The marketing and promotion budget has been kept at about Rs 1 lakh a month. About 70 per cent of customers are SMEs; business customers account for 90 per cent of the revenue. However, these are early days for business consumers, in terms of online printing. Consider Noida-based Abhinav Singh, who runs a mobile accessories company, and has been a Printland customer for the last six months, primarily for printing visiting cards, brochures, pamphlets. He has generated business worth about Rs 30,000 for the start-up. While online printing turns out about 10 per cent cheaper for low-value products, the biggest value-add is the time saved, he says. However the bulk of his print budget — about Rs 1.5 lakh a year — still goes to his neighbourhood off-set vendor. In time, he plans to shift some of this spend online. Gopal Bhargava, who runs an off-set printing press in Kanpur, doesn’t feel online printing companies are a threat to his business. “They are likely to be active in the low-volume customer space,” he says. Even as Printland finds its feet in the nascent market for online printing, competition is already hotting. VistaPrint has set up a printing facility in Mumbai and a design centre at Vadodara. “It is a long-haul business, focusing on user experience and quality,” says VistaPrint’s Narang. Through the next few months, plans are afoot to supplement the online presence with offline consumer touch points such as kiosks. Many industry players consider Printland’s repeat customer business to be low. PrintBell, at the time of its acquisition by VistaPrint, had about 75 per cent repeat customer business, after three years of operations. When it comes to offering customisation service on the portal, Printland appears to be on shaky ground. Considering the growing competition in the segment, low marketing and advertising spends could take a toll on Printland’s brand positioning and top-of-the-mind recall among customers. Printland also needs a dose of capitalisation for an integrated back-end printing set-up. As the business scales up, this would help improve margins and tackle quality-related concerns. Behl and Kakar, however, put up a brave face against the growing competition. “Big-ticket competition only validates our business plan and would help to grow the market size,” says Behl. Their plan would be put to test when the business scales up through the next two to three years. Relying solely on organic growth through the portal might not be sufficient. A hybrid model, with integrated back-end and front-end operations and a captive printing set-up, might be the order of the day.